Summary: Several towns in the African country of Mali have fallen out of government control this month, taken over by a separatist group known as the National Movement for the Liberation of Azawad (MNLA). The rebels are led by members of the Tuareg ethnic group, traditionally nomadic inhabitants of the Sahara Desert, who dwell in Mali's northern regions and have a long history of conflict with the national government. 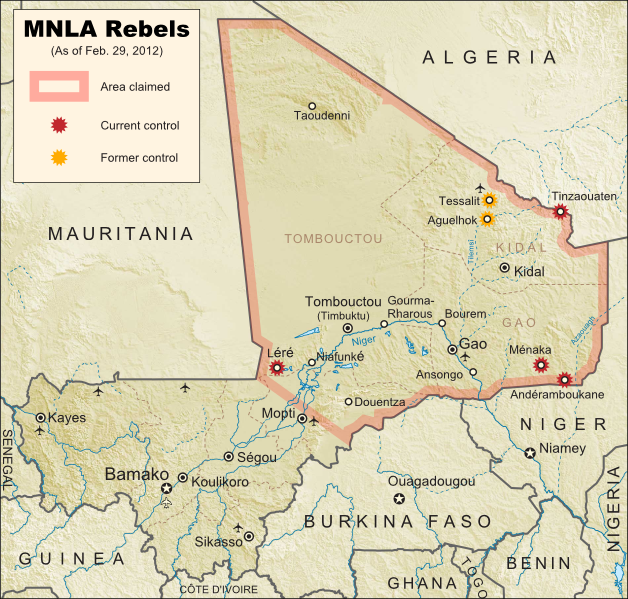 Towns captured by the MNLA rebel group in Mali. Modified from Wikimedia map by Orionist, incorporating images by Carport and NordNordWest (source). License: CC BY-SA. One of the many African states formed based on arbitrary borders from the European colonial era, Mali is divided into two visibly distinct regions which are both geographically and ethnically distinct. The southern area, which hosts the majority of the population, has a tropical climate and is dominated by the Bambara and other West African peoples, while the northern region is located in the Sahara Desert, historically the domain of the Tuareg nomads. Over the last century, there have been at least four separate rebellions led by Tuareg people, many of whom feel their homeland should never have been included in Mali in the first place. 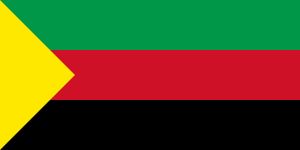 Now, the recently formed National Movement for the Liberation of Azawad (MNLA) has begun one more uprising against Mali, with better chances of success than ever before. The war began on January 16th of this year, when MNLA forces launched an attack on the town of Ménaka, the next day taking control of that location as well as the towns of Aguelhok and Tessalit, both of which lie in the area bordering the rebels' bases in the mountains of the Kidal region. On January 18th, the Malian army apparently recaptured all three towns, but the MNLA was not deterred. After another unsuccessful takeover of Aguelhok on January 24th, the revolutionaries finally captured and held onto the towns of Andéramboukane and Léré on the 26th, penetrating unusually far into the south of the country. On February 1st, rebels again captured Ménaka after government forces withdrew from the town, and one week later the MNLA secured the border town of Tinzaouaten, driving their opponents from the Malian military across the border into Algeria. The city of Kidal also saw fighting in February, and the conflict continued throughout the month, though no further territorial gains by the MNLA have been reported in the last three weeks. 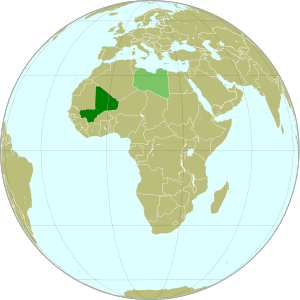 The MNLA, although composed largely of Tuareg people, has also made a major effort to include Arabs, Songhai, and other peoples of "Azawad" (Northern Mali), where it hopes to establish an independent country. However, not all northerners support the revolt; Tuareg, Arabs, and members of other groups are fighting on both sides of the conflict. The MNLA is much better armed than previous revolutionary groups, partly because many exiled Tuareg rebel leaders have recently returned to Mali from nearby Libya - many of these veteran revolutionaries were employed and armed by the Libyan government, and eventually ended up fighting on both sides of that country's 2011 civil war (a part of the Arab Spring revolutions). However, this new uprising also has the advantage of being the best organized yet, and of commanding a vastly more effective public relations network than ever before. The Malian government has also accused the rebels of being in league with Al Qaeda in the Islamic Maghreb (AQIM), a local affiliate of the worldwide terrorist organization; however, evidence for this is scant, and many from the MNLA in fact consider AQIM to be among their greatest enemies. 2012-1-26. "Tuareg rebels attack fifth town in Mali". Al Jazeera. 2012-1-31. "Tuareg rebels take Mali town after army pullout". AFP. 2012-2-2. Stewart, Scott. "Mali Besieged by Fighters Fleeing Libya". Stratfor Global Intelligence. 2012-2-6. Morgan, Andy. "The Causes of the Uprising in Northern Mali". Think Africa Press. 2012-2-9. Diallo, Tiemoko & Adama Diarra. "Malian rebels seize key border town, civilians flee". Reuters.